We are excited to announce our latest additions to our product. One recurring theme in the feedback we've got is that in addition to seeing trends, our users wanted a way to see weekly counts of open or completed tasks, and preferably as bar charts. We listened and now we're introducing bar charts! These are now available for all users. Read on to learn how to take these into use. We've redesigned the quick select menu that we recently introduced to Open and Completed tasks screens. Now it comes with more functionality as you can use the same menu to switch between the reports, and to select the grouping for the chart. You can hover over with mouse on individual bars to see breakdown of numbers for that specific week. You easily switch between groupings from the top right menu (e.g. to see the number of tasks completed per assignee instead of label). Can't find the chart you were looking for on any of the screens available? 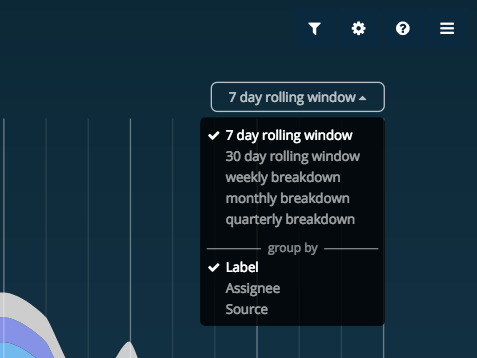 Worry no more, now you can create your own charts. To create a custom chart, click the create custom chart link the dashboard settings. After clicking the link you'll get a set of drop down menus which allow you to select the properties for the chart. Initially, we support bar charts and stacked bar charts positioned either horizontally or vertically. New chart types will be added in the future. Learn more about the custom chart from our blog post. Were you wondering why these screenshots look different than usual? It's because they're using a new colour theme! In addition to the standard Blue, we have now Dark blue and Black available as new options. The new darker colour themes offer a maximum contrast, which is great especially when running in the TV mode. Give them a try! 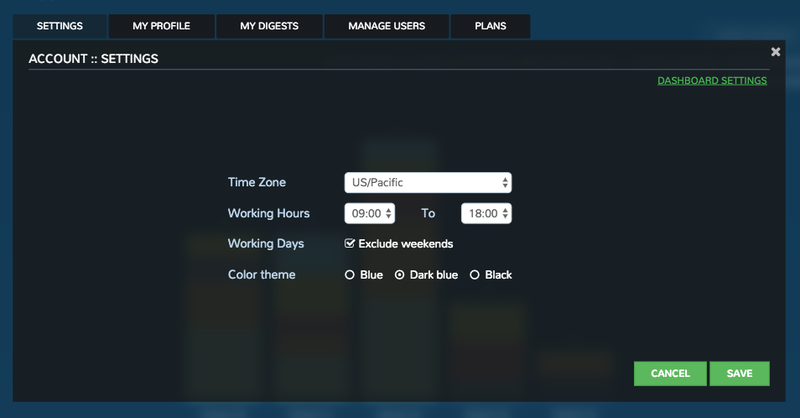 You'll find the theme selection at the Account ► Settings under the setup menu. If you don't work on weekends, you may want to omit those days from cycle time calculations. Now you can do that as well as set your timezone, and the exact working hours. You'll find these also at the account settings. For those using the on-prem version, these features will be available within a week or so on Screenful 2.4 on Docker Hub. You can pull it from the screenfulorg/screenful repo once you have shared your docker hub id with us. We hope you enjoy this release as much as we do! Please do not hesitate to contact us any time at hello@screenful.com if you have questions or feedback. Read more about the custom chart on our blog post and follow us on twitter.